The Nikon C1 confocal system delivers 3 dimensional confocal fluorescent images of samples with high resolution and contrast. Confocal microscopy allows analysis of fluorescent labeled thick specimens without physical sectioning. Optical sections are generated by eliminating out-of-focus fluorescence and displayed as digitalized images. It allows 3-dimensional reconstruction (XYZ) and time-analysis (XYT), thus providing unique chance to link morphology with cell function. 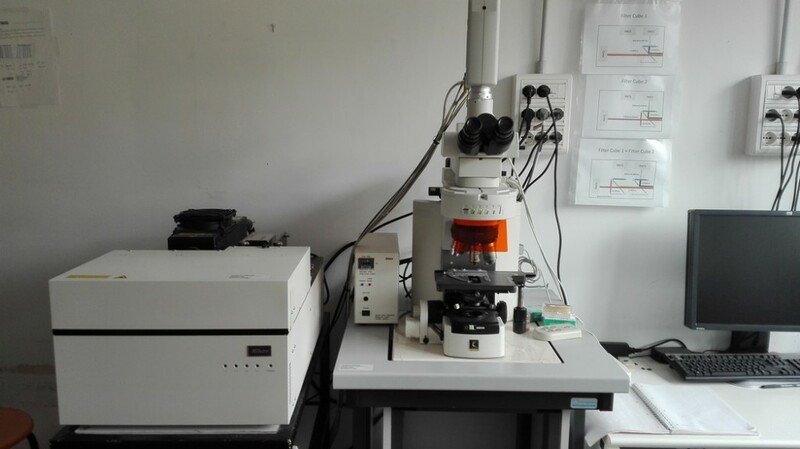 Descrizione caratteristiche operative The Nikon C1 confocal system is equipped with a Nikon Eclipse E600 direct microscope and 2 laser (a diode module at 405 nm and a multiline Ar laser with emission at 457/488/514nm). Its scanning head has 3 photomultiplier tubes (PMTs) which can detect simultaneous 3-channel fluorescence in double- and triple-labelling experiments. 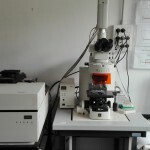 The microscope is equipped with several objectives in air (from 5X to 40X and with a 60X in oil. A digital camera provide bright-field and fluorescent imaging capabilities (image resolution: 1600×1200 pixels). Campi di applicazione The broad range of applications available to laser confocal microscopy includes a wide variety of studies in material science as well as morphological studies of a wide spectrum of cells and tissues. The CNR IPCF Bari synthesizes by colloidal approach new fluorescent inorganic nanostructures that are used as probes. Other applications include resonance energy transfer, stem cell research, photobleaching studies, total internal reflection, bioluminescent proteins etc.